When a book can take its plot from the headlines and mix in suspense and life-threatening drama, it can be just the book for me. The Domino Effect by Davis Bunn is exactly one of those books. The basic story is something we hear on the news or read in the papers daily. That by itself is scary enough. Add backroom dealings and you have a sneak peek into a world that is truly frightening. Esther Larson is a risk analyst at a leading bank in the country. While she has spent her career making billions for her bank with quick hit investment plans, she is starting to see a growing trend in the banking industry after the 2008 banking fiasco. Banks are returning to their decadent ways, and trying to hide greater transgressions behind blinds. All this has Larson concerned for the global economy. Reading all the signs, Larson realizes that the market is right at the tipping point, and that steps need to be taken to either save investments or to ease the pain. She meets up with some friends who urge her to go public with her projections. This immediately puts her on the radar of her superiors at the bank. While Larson is telling the world of impending doom and what can be done, the banking executives are hedging on a fall in the dollar. They are lining up to cash in on the distress of the world’s misfortune. Once they realize that Larson is getting closer to uncovering their diabolical plans, they send out a team to “take care” of her. Despite the attempt on her life, Esther Larson continues to move forward with her plans to safeguard the public from the banking industry. She severs the relationship she had with the bank, and instead makes a new life unveiling the threats that they have on the global economy. 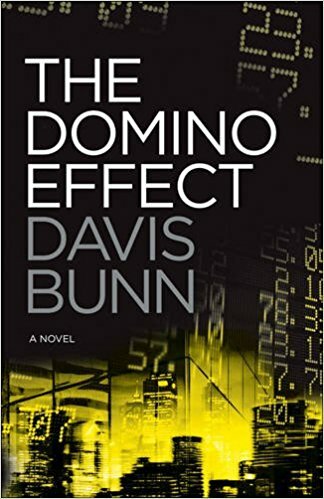 Davis Bunn writes an exciting thriller that could be culled from the headlines of any recent newspaper. While some people might think that the numbers game of banking is boring, Bunn writes it in a way that will keep the reader turning pages. There are moments that the techno-speak for banking might get a bit overwhelming, but it’s so rapid-fire that you get the gist of it and move on quickly. While all the intrigue and espionage is going on, the mistakes from the 2008 banking failures are highlighted. The inner workings of a seemingly corrupt institution are exposed. I don’t know for certain if people at big banks operate in this fashion, but if it is, Bunn has captured it well. Consider it a “House of Cards” for the banking industry. Davis Bunn has written many other books. This was the first time I have read one of his books. If this is the caliber of writing that I can expect from his other works, I will be visiting the library to add more of his novels to my reading shelf. Take the time to read The Domino Effect. You won’t be sorry. Craig Bacon has enough money to invest in Slurpees and a bag of donuts. The risk on that is high….on his health.